SeaWater Air Conditioning (SWAC) takes advantage of available deep cold seawater to replace energy-intensive central refrigeration systems that cool chilled water to provide air conditioning in one or more buildings. Such a system can also utilize cold lake or river water as the cold source. This web page describes the Benefits, Basics, Environmental Aspects, and Economic Benefits of a SWAC system. It also describes Case Studies and Makai’s Engineering Services for Seawater Air Conditioning. Makai’s experience in SWAC design and analysis results directly from our work with deep, cold seawater pipes. A seawater air conditioning system is illustrated to the right. The buildings to the far right are identical internally to buildings cooled with conventional A/C. Chilled fresh water moves through these buildings with the same temperatures and flows used in a conventional A/C system. A conventional chiller, however, does not cool the chilled water loop in this system. The low temperatures in the chilled water loop are maintained by passing this fresh water through a counter-flow heat exchanger with the primary fluid being deep cold seawater. The two fluids are on either side of titanium plates that transfer the heat from one fluid to the other and do not mix. The seawater intake pipeline brings in water at a temperature lower than the temperature maintained in the chilled water loop. Once the seawater passes through the heat exchanger(s), it is returned to the ocean through another pipeline. The main components of a basic seawater air conditioning system are the seawater supply system, the heat exchanger or cooling station and the fresh water distribution system. These basic components can be optimized for each specific location, climate and building. For a large building using a conventional air conditioning system, a constant flow of cold fresh “chilled water” is circulated throughout the building for heat removal. As this chilled water moves throughout the building and absorbs heat, its temperature rises from an incoming value of approximately 7-8°C to an outflow value approximately 5°C higher. This warm chilled water then enters the chiller, a refrigeration system that cools the recirculating fresh water. Water enters the chiller at a nominal 12-13°C and exits at 7-8°C. The water flow through the building varies with demand and the temperature of the water leaving the chiller is constant. The chiller consumes electricity as it “pumps” heat from a cold source to a warmer source. The figure at the left illustrates the chilled water loop circulating through multiple buildings. In this case the chiller has been replaced by heat exchangers that use deep cold seawater for their cold source to form a SWAC system. Seawater air conditioning is not technically complex nor does it involve a high technical risk. It is established technology being applied in an innovative way. All the components necessary exist and have been operated under the conditions required. A SWAC system may have significant environmental benefits: These include drastic reductions in electricity consumption which reduce air pollution, greenhouse gas production and dependence on fossil fuels. SWAC substitutes simple heat exchangers for chiller machinery which often use ozone-depleting chlorofluorocarbons (CFCs). The existence of the deep water ocean heat sink results from natural climatic processes where water is cooled at the poles, becomes dense and sinks to deeper water. The figure to the right shows a temperature profile in the tropics typical for the world’s deep oceans. 7°C or colder can often be reached at 700m depth, 5°C or colder at 1000m. The deep-water portion of this profile changes little seasonally, and therefore, cold water is available on a year round basis. The feasibility of using cold seawater to directly cool buildings has been studied and analyzed for many years. At certain locations, successful installation and operation has occurred. Large lakes may also provide nearby sources of cold water for cooling. Return water from a SWAC system can be handled in a number of ways. Typically it is returned to the ocean at a location where the return water temperature nearly matches the ambient water. There are significant secondary applications for this seawater. Secondary cooling, aquaculture, desalination and even agriculture can benefit from the cold seawater. Aquaculturists value the water because it is clean, disease free and high in nutrients. When used in conjunction with a warm source of water, any temperature of seawater can be obtained to meet product needs. Secondary cooling can be used in greenhouses and other locations where humidity control is not a major factor. Research in Hawaii has been conducted and results claim that cooling the soil and roots of many tropical and non-tropical plants can improve productivity and reduce fresh water consumption. Deep seawater is also desalinated and sold as a premium drinking water in the Far East. In 1975, the US Department of Energy funded a program entitled “Feasibility of a District Cooling System Utilizing Cold Seawater.” [Hirshman et. al.] Several locations were studied and the two most favorable sites were Miami/Ft. Lauderdale and Honolulu. The study, however, noted that one of the limiting technical factors was the inability to deploy large diameter pipelines to depths of 1500′ and more. This technical challenge has since been addressed and demonstrated with deep-water pipelines at the Natural Energy Laboratory of Hawaii at Keahole Point, Hawaii. In 1999, the Cornell Lake Source Cooling Project installed a 63″ diameter pipeline into nearby Lake Cayuga. This pipeline is 10,000′ in length and is installed to a depth of 250′. Cold water from this pipeline, at approximately 4°C, provides air conditioning for the Cornell University Campus. The volume of cooling that this system provides is in excess of 20,000 tons (75,000 KW), and the system has been operational since mid-2000. Another large cold lake water project includes the Deep Lake Water Cooling Project, Toronto, Ontario, Canada. Enwave Energy Corporation of Toronto, Ontario, Canada has developed a district cooling system that utilizes cold water from Lake Ontario to provide air conditioning to downtown Toronto. The system includes 3 each 63-inch (1600 mm) polyethylene intake pipelines that are more than 18,000 feet long and reach a depth of 272 feet. Cooling operations began in the summer of 2004 and more than 30 offices and commercial centers are now being air conditioned for a total of about 58,000 tons (204,000 KW) of cooling. The fresh water drawn from the lake is re-used to provide clean drinking water for the City of Toronto. The marine construction infrastructure: if marine contractors are available locally, this will reduce offshore construction and mobilization costs. The adjacent figure illustrates the difference in lifetime costs for a conventional AC system and a typical SWAC system. The costs are broken down into capital, operating (energy) and maintenance. The primary cost of a SWAC system is in the initial capital cost. The operating and maintenance costs are small. For a conventional AC system, the primary cost is in the power consumed over its lifetime. Hence, SWAC systems are ideal for base load AC that has high utilization and conventional AC may be better for situations of infrequent use. It’s important to note that there is a dramatic economy of scale as the size of the pipeline increases. The reason is that the cold water pipe costs per volume of water delivered decreases as the pipeline size increases, and temperature rise via large pipelines is practically negligible. The figure to the right illustrates five SWAC scenarios of varying overall size; the two bars compare the life time cost difference between conventional AC and SWAC. Note that larger capacity systems typically do better compared to conventional A/C systems. Makai has performed SWAC feasibility studies at a variety of sites. Typical results for good SWAC sites are that electrical consumption is reduced by 80 to 90 percent. Simple payback can be from three to seven years, and long term costs can be half that of a conventional air conditioning system. Not all locations, however, are ideal. Some have poor access to deep cold-water sources or the overall load is too small to be economical. Each site is unique. The energy requirements for a large building’s air conditioning system are significant. Approximately 45 percent of a large hotel’s total electric bill goes towards air conditioning and about 2/3 of that is for operating the chillers and cooling towers. Chilling this water requires approximately 1 ton of cooling for an average hotel room. Large buildings may take many hundreds to many thousands of tons, requiring a peak electrical demand for air conditioning of 1 megawatt or larger. Therefore, operating chillers to keep the chilled water at 7°C comes at a significant power cost. The other 1/3 goes into running the fans for the air handling inside the building and is unaffected. The graph to the right shows an economic comparison conducted in 2000 for the airport in Curacao, Netherland Antilles. The economic viability of seawater air conditioning was determined by comparing the construction and operating costs of the seawater supply system to the construction and operating costs of conventional air conditioning (A/C) systems, including the performance under varying daily and seasonal load conditions. The study concluded that Seawater Air Conditioning had a life-cycle cost one-half that of conventional systems. The capital cost and energy use of a SWAC system was sensitive to the pipeline length, which is dependent on the seawater temperature near the seafloor versus the distance from shore at the site. At a hypothetical typical Navy facility, a SWAC system will use 80% less energy than conventional A/C, but the capital costs of SWAC systems are 60% greater. The Life Cycle Cost of SWAC at a typical Naval facility would be 25% lower than the life cycle cost of conventional A/C. In 1986, a joint project between the Canadian government and Purdy’s Wharf Development, Ltd. demonstrated the use of ocean water as a source for building cooling for a 350,000 square ft. office complex along the waterfront in Halifax, Nova Scotia. Due to the geographic conditions and annual low water temperatures, a small diameter pipeline was deployed to a depth of less than 100′ ft. This was a major factor in limiting the overall expense of installing the cooling system. Total investment for this project was $200,000. The project was very successful and savings were identified in the following areas: a saving of $50-60,000 per year in avoided electrical cost, fewer maintenance staff, reduction in fresh water use, savings in water treatment, and savings in cooling tower maintenance and replacement. The financial result in terms of a simple payback period was two years. Today, Purdy’s Wharf continues to successfully utilize an expanded seawater air conditioning system for their waterfront properties. In 1986, the Natural Energy Laboratory of Hawaii Authority, Keahole Point, Hawaii began the successful utilization of SWAC in their main laboratory building. Deep-water pipelines were already installed to provide cold, nutrient rich, seawater for research purposes in alternate energy and aquaculture. Since a cold water supply was already incorporated into the infrastructure, it was decided to utilize the cold water for cooling. Today, the use of SWAC has been expanded to a new administration building and a second laboratory. Estimated monthly electricity savings are $2000. In 1990, the US Department of Energy funded a study entitled: “Waikiki District Cooling Utility.” The purpose of this brief study was to evaluate whether it was economically and technically feasible to utilize seawater air conditioning as a means to provide cooling to the hotels in Waikiki and to create a Waikiki Cooling Utility. [Darrow-Sawyer]. Waikiki was targeted because of the high density of hotels, high electrical consumption and a large demand for air conditioning. It was estimated by Hawaiian Electric Company that of the 107 Megawatts consumed in Waikiki, 51.4 Megawatts were used for air conditioning. This study concluded that economically and technically, Waikiki could be cooled by utilizing seawater air conditioning. Hindering progress on this concept is the difficulty of installing the distribution system throughout a high-tourist region. In 1995, Stockholm Energy started supplying properties in central Stockholm with cooling from its new district cooling system. Most of the cooling is produced by using cold water from the Baltic Sea. The temperature of the cooling water leaving the plant is 6°C or lower and the return temperature from the distribution grid is 16°C at high load and a few degrees lower at low load. The district cooling system is designed for a maximum load of 60 MW. A SWAC system has a fairly significant capital cost, and the peak capacity of the system must match the peak demand of the buildings that it serves. Cold Water Storage can reduce the average system size needed to meet the peak cooling requirement. The seawater air conditioning system would be operated 100 percent of the time and when the building demands are low, the excess capacity is directed into a storage system of cold fresh water. When A/C demand is at its peak, the cold water is drained from its storage to meet the demand. Cold water storage tanks are commercially available that are constant volume; the warm water remains at the top and the coldest water remains at the bottom. These tanks are now used in conjunction with conventional A/C systems to take advantage of low, off-peak electrical rates. In some cases, it is either too costly or impossible to supply seawater at the necessary low temperatures to maintain minimum temperatures in the chilled water loop. The distance offshore to reach sufficiently cold water might be prohibitive or the ocean depth may simply not be available. As shown in the adjacent figure, it is possible to economically use auxiliary chillers to achieve the desired minimum chilled water temperature. With the condenser rejecting heat to the discharged cool seawater, the auxiliary chiller can operate at higher efficiency than if it were cooled by other means. The primary factors impacting the economic success of seawater air conditioning are the size of the air conditioning load, accessibility to deep cold water, the percent utilization of the system and the local cost of electricity. Knowledge of these factors for a given locale plus the deep ocean pipeline experience of Makai are the key elements in conducting a critical assessment of the economic potential for SWAC in a particular area. The key cost and risk component of any SWAC system is the offshore pipeline. The lack of a low-cost methodology for the installation of these pipelines prevented SWAC development in the 1970’s and 80’s. Today, the technology for the successful installation of pipelines to depths of 3000′ and greater is available. Numerous deep water intake pipelines have been installed – nearly all of the world’s successful pipes have been Makai designs. 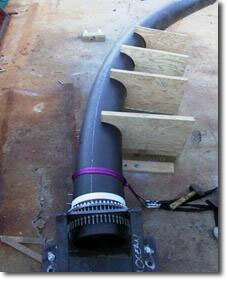 All of the deep seawater intake pipelines designed by Makai have used polyethylene as the pipeline material. Polyethylene has significant advantages for these pipelines in that it is inert and will neither corrode nor contaminate the water. Polyethylene lengths are heat fused together to form a long, continuous pipeline with joints that are as strong as the pipeline itself. Polyethylene has excellent strength and flexibility and is buoyant in water. These characteristics allow a great deal of design flexibility and deployment ease. The wall thickness can be varied depending on strength requirements for deployment and operating suction over the lifetime of the pipe. Makai’s approach for a deep water pipe deployment is to minimize the time at-sea. The pipeline is basically designed for the deployment process since this represents the major cost and risk of the installation. The pipeline is assembled complete on shore, launched floating using the pipeline to support all anchors and fastenings, towed to the site, and controllably submerged while carefully monitoring pipe tensions and pressures. The procedure is stable and reversible. The major risk to the pipeline is during deployment. These are standard marine construction risks and would be covered by the installer’s insurance. 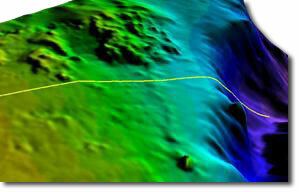 Once deployed, the likelihood of a pipe failure in deep-water is very remote. In 2011, Makai became a member of the International District Energy Association. This organization promotes energy efficiency and environmental quality through the advancement of district heating, district cooling and cogeneration. It allows Makai access to other District Energy professionals and knowledge of the equipment, techniques and engineering common to this industry.